Jackson Hole is a snowmobile haven! Snowmobile operators accommodate all experience levels with trips offered in a variety of areas, such as Granite Hot Springs, along the Continental Divide, through the Gros Ventre area to explore wildlife, and more. This tour takes you snowmobiling through the beautiful Gros Ventre (pronounced grow-vont) area, offering stunning views of the Teton Mountain Range and chance to see wildlife such as elk, deer, big horn sheep, bison, eagles, and moose. Perfect for those looking for an easy, relaxing snowmobile ride. Lunch at a backcountry guest ranch and transportation provided. Driver age minimum of 16 years old. After a short drive down to the Granite Hot Springs Trailhead, you will load onto your sled and ride through this beautiful backcountry trail system and enjoy never-ending views of the surrounding snow-covered mountains. After a few miles, you will reach the hot springs, where you can take a dip and relax for 1-2 hours before enjoying lunch and heading back to the trailhead. Please bring a bathing suit and a towel. Transportation and Lunch included. The full day tour lasts 6-7 hours. Half days last 4-5 hours and allow for 20-30 minutes in hot spring. This exciting trip is perfect for those seeking off-trail adventure or experienced riders looking for deep Wyoming powder! Views of beautiful alpine vistas and a hearty lunch at a backcountry guest ranch are just a couple of highlights of this full day tour. Trip lasts about 7-8 hours and includes transportation and lunch. 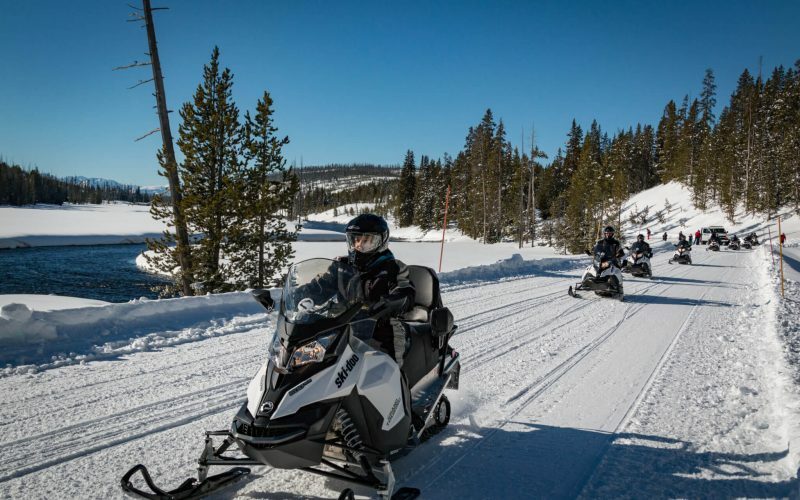 An extensive 600 mile trail system and stunning views of the Tetons, Wind River Range, Gros Ventre Mountains, and Absaroka Mountains, make this is one of the most popular snowmobiling areas in the country! A variety of terrain with both on trail and off-trail riding makes this tour a great fit for riders of all experience levels. This full day tour includes transportation and lunch. Driver age minimum of 15 years old.